The Fighting Fish managed to salvage a victory from their series in Milwaukee taking the finale after dropping the first two contests, ending a 4-game skid in the process. 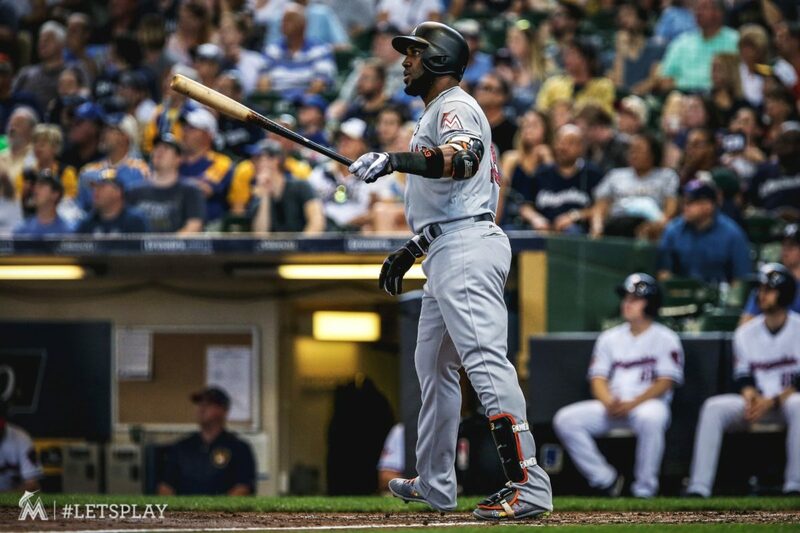 While there were indeed some pretty frustrating moments in the series, surprise surprise, the Marlins put together an adequate performance on Sunday with Marcell Ozuna going yard twice in the game hours before the All-Star Game selection. First things first, while we did lose the opener 3-2 I must admit it was a hard fought game that left me satisfied as a baseball fan. Edinson Volquez squared off against Matt Garza as both teams kept each other off the scoreboard for the first four frames. The Marlins drew first blood in the fifth with a line drive from J.T. Riddle, scoring J.T. Realmuto. Dee Gordon then scored in Riddle on a beautiful sacrifice bunt that led to a wild throw to home plate from Garza. When the dust settled the Marlins shot ahead 2-0. However, a pair of long balls from Brewers catcher Stephen Vogt doomed Miami in the opener. The first was a solo shot in the fifth off Volquez followed by another, this time off Phelps in the seventh. A 2-run blast dead center. The Marlins did mount an exciting ninth inning push as Realmuto drew a walk followed by Derek Dietrich hitting a double to left. Unfortunately, Realmuto was called out at home after the strong relay throw from shortstop Orlando Arcia. Riddle struck out and despite Martin Prado drawing a walk, dear Dee got called out on strikes. We fell short in a hard fought game. Volquez ends his day with a no-decision and Phelps gets charged with both the blown save and the loss. Game 2 was definitely an early disaster. Tom Koehler returned from the minors to face Zach Davies. It was his first start for the Marlins since May 16. Again, as previously mentioned all it takes is one bad inning. Despite a 2-run double to open the game from Justin Bour, Koehler got wrecked in the second giving up 7 runs, 3 of them earned, including a 2-run dinger from Domingo Santana which by the way Stanton could of totally caught. Somehow not only does it land cleanly into his glove, it just…popped back out. I mean he got his entire glove on it and back out it goes. A seemingly easy catch ending in disbelief. For him and for me. The Bullpen was called into action and despite the rather undesirable circumstances, performed admirably putting a stop to the Brewers hit parade. Though it’s worth noting Nick Wittgren did give up a run as Arcia airmailed one over the fence in the fifth. Regardless, kudos to Worley, Wittgren and Tazawa for doing what, clearly, Koehler could not. The 2-run shot wasn’t his fault but the other 6 runs are inexcusable, welcome back from the minors. Despite the bullpen’s best efforts, the damage was just too great to overcome as the Marlins fell for the fourth consecutive game by a score of 8-4. The Marlins did threaten in the seventh with Brewers reliever Josh Hader coming in to take over, as leadoff hitter J.T. Riddle drew a walk followed by a double from pinch-hitter Tyler Moore. Suddenly, the Marlins’ offense just sputtered to a complete halt as Gordon, Stanton and Yelich were retired. And now to the series finale. Dan Straily took to the hill looking to improve his record while the Brew Crew deployed Junior Guerra hoping for a series sweep. As a random note, just prior to the third inning Brewers power hitter Eric Thames ripped a foul ball right into Realmuto’s face, knocking his mask off. He was just fine but woah. Speaking of power hitting, Ozuna fired a three run shot scoring Realmuto and Yelich in the third. And his great day was only getting started. A pattern would emerge in the fourth and last for a good portion of the game highlighting our offensive struggles. With runners in scoring position, Giancarlo Stanton hit into an inning ending double play. Over in the fifth, Justin Bour hits a sweet double into right driving in a run to make it 4-2. A big chance presented itself to put some distance with the bases loaded as Riddle was up to bat. The rookie hits it to second but beats out the double play, or did he? After the review the call is overturned, erasing our fifth run. Personally the replay didn’t reveal conclusive evidence but it was still pretty bang bang. That and the officials in New York get access to ALL the angles. Orlando Arcia struck with a solo shot at the bottom of the fifth to make it 4-3, causing the Marlins to definitely start looking back at the last two innings on what could’ve been. The prior scenario plays out again in the sixth with 1 out and runners at first and second. Yelich at this point was 2 for 2 so far with a pair of singles and a walk. Boom! He rips it into right field, Realmuto rounded third and scored making it 5-3. With runners at the corners and 1 out, reliever Rob Scahill comes in for Milwaukee with Ozuna at the plate. 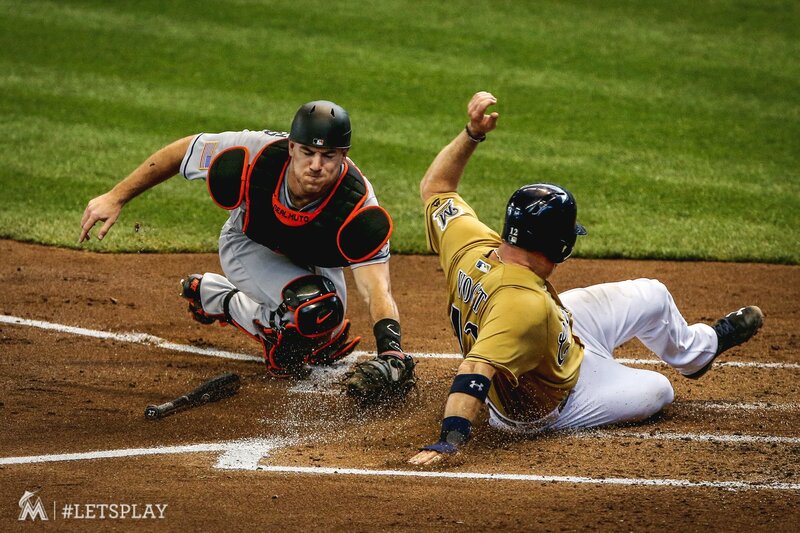 Yelich proceeded to steal second, ending a double play threat. However, Ozuna goes down to a breaking ball. Bour was then intentionally walked with Prado up next. The bases juiced, two gone now. Sadly, Prado grounds out and we once again have to settle for a run. In the seventh it happens again, Dietrich jets one to right to make it 6-3 to start the inning. Then Arcia makes an errant throw, messing up the double play as Ichiro rushes to third. Stanton came up to bat with runners at second and third only to slam a grounder to short resulting in Ichiro getting tagged out at the plate. Yelich too, grounds out. Basically, for three straight innings we had a pattern of scoring early and while the team succeeds to subsequently put runners in scoring position later in the inning, they just end up stranding them. A bit frustrating because in games were runs are at a premium the team cannot afford to mess up brilliant scoring opportunities. On this game alone, they left 15 runners on base. After the seventh inning stretch the Brewers threatened but Stanton made a tremendous catch to keep the runners from scoring, with Kyle Barraclough retiring Stephen Vogt with runners at the corners to end the inning. Ozuna then launched his second homer of the day in the eighth putting us up 7-3, hours later he got beautiful news. For his efforts this season, especially these last few weeks, the fans deemed him worthy a starting position on the NL All-Star Team, congrats man very well deserved. He ended the day 3-for-6 with 2 HRs and 4 RBIs. Realmuto finally broke the pattern getting his third hit of the game, digging it out into center, scoring 2 to make it 9-3. The Marlins would ultimately win it 10-3 but after a terrific month of June scoring 5.8 runs on average, everybody knows that sort of production is unsustainable. Making it all the more important to not allow what occurred from the fourth through seventh inning where run opportunities are aplenty… only to come away with just 1. The first game of the series is a good example of being unable to take the opportunities as you get them, never knowing if that is the last of your fortunes. Either way, a win is a win and despite my offensive nit picking it was a rather convincing one to say the least. Dan Straily went six deep to improve to 6-4 and the bullpen maintained itself as Barraclough, Phelps and Ramos allowed only 2 hits through three innings of work. No doubt the four game losing streak set us back, giving the tilt with the St. Louis Cardinals that much more importance. If we can split the series, I’ll be happy. Stat of the Week: The number 2. The last time Nationals first basemen Ryan Zimmerman made it to the All-Star Game was in 2009. That changed Sunday as he was selected for only the second time in his career. While I would have loved Bour to get in (he still can), I tip my cap at this literal, comeback story. Congrats Zimmerman. A new, occasional section to my madness. I’ll be watching out for any new signings post MLB draft in addition to creating another pair of add-ons that include observing the performance of our Triple-A affiliate the New Orleans Baby Cakes and one specific individual who shall remain anonymous, for now. Anyways, the Marlins signed the No. 12 international prospect, shortstop Ynmanol Marinez, according to MLB Pipeline. 16 and straight out of the Dominican Republic, he was our club’s big catch of the day, the first day of the international signing period. The Marlins were considered favorites to land the kid on a day that included 12 other team signings: Venezuelan shortstop Julio Machado, catcher Jonathan Chinchilla and right-handers Jean Carlos Flores and Zaquil Puente, also from Venezuela as well as catcher Jhonaiker Osor from Panama to name a few. According to MLB.com’s Jesse Sanchez, Marinez signed for $1.5 million and joins a rather illustrious list of international signings made by the team: Marcell Ozuna, Jose Urena, Miguel Cabrera, Livan Hernandez and Edgar Renteria. Let’s hope he is just as successful as they were. For some technical information, under MLB rules, an international player is eligible to sign with a big league club between July 2 and June 15 of the following year if he is 17 or will turn 17 by the end of the first season of his contract. Also as a part of the current Collective Bargaining Agreement, every team gets at least $4.75 million to spend on international prospects. Any team receiving a Competitive Balance Round A pick in the draft gets $5.25 million. The Marlins had this pick in June, meaning they have up to $5.25 million to spend. And as part of the new rules, a club can trade as much of its international pool money as it wants but is limited to 75 percent of the initial pool, all according to MLB.com’s Joe Frisaro. I hope you enjoyed this rather insightful edition of Views From The Cheap Seats and as always, stay frosty.